We are influenced by color every day. Think about it. From the serene blue walls that you see when you crawl out of bed to the vibrant orange purse that you throw over your shoulder before heading out the door. Many times we choose colors and are not even aware of the feeling they evoke and how we subconsciously react to them. What colors speak to you?! Moxie teamed up with Wausau Coated Products Inc. — a leading manufacturer of pressure sensitive roll and sheet products — to design and develop a sales kit for a national tradeshow. To showcase and design pressure-sensitive products in an attractive and elegant manner — appealing to the wine label industry. 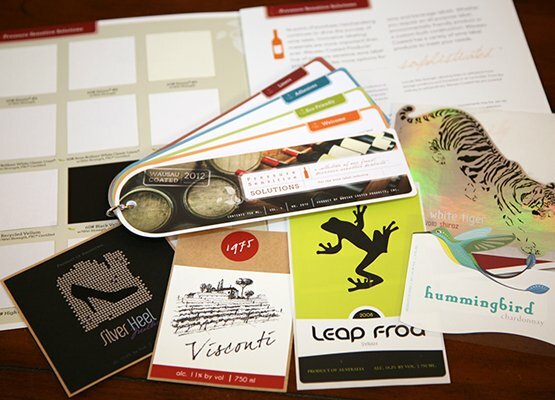 To create a cohesive look for the Sales Kit that the target market can use as tool and guide for purchasing pressure-sensitive products in the wine label industry. Designed Pressure-Sensitive Chip Chart that displayed full line of pressure sensitive products in one easy-to-read chart. Chart also highlighted environmentally friendly products. Designed Pressure-Sensitive Swatch Book that allowed the target audience to use as a tactile and visual buying tool. 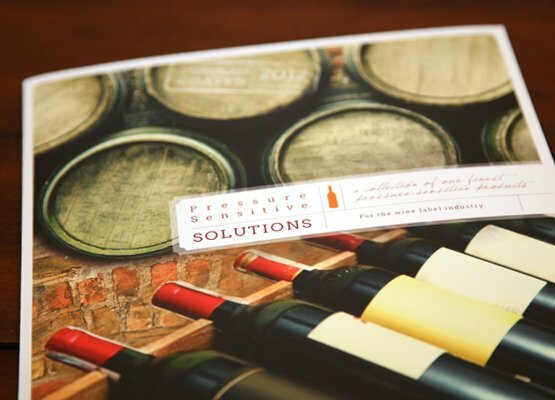 Designed a collection of wine labels that highlighted several pressure sensitive products available through Wausau Coated. This approach allowed the wine making industry to visualize how pressure sensitive products look as a final product — as opposed to on a roll or sheet. 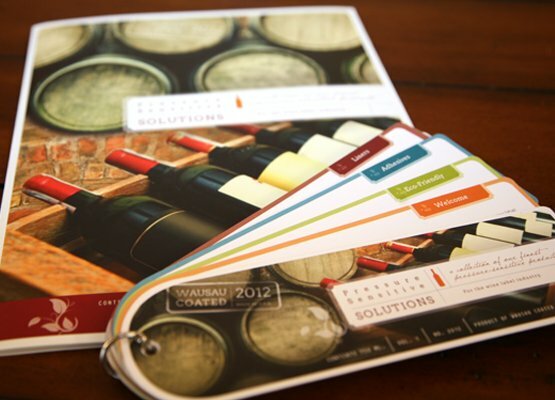 The project was an overwhelming success and as a result Moxie won a gold ADDY Award in the design competition for the Unified Wine and Grape Symposium Sales Kit created for Wausau Coated Products. The ADDY Award competition is one of Fox Valley’s largest advertising award events, held Feb. 28, 2013 in Appleton, WI. To learn more on how Moxie can help develop your company’s marketing materials, please contact us at [email protected] or call us today at 715.359.7141! Tis the season of caring, sharing and Fa-La-La-ing!!! During this holiday season, Moxie wanted a way to share the joy of the Christmas with those who needed it most. Moxie coordinated the first annual Fa-La-La-La Merry Moxie Food Drive and asked local businesses in the Wausau area to collect food from within their company during the week of December 10th through December 14th. During the week of December 17th through December 19th, Moxie will be collecting all donations and delivering them to the Salvation Army and Neighbor’s Place in Wausau. We will also be holding an OPEN HOUSE at MOXIE on December 20th from 9am – 3pm for anyone who would still like to drop off donations. We are thankful for all of this year’s participants and look forward to adding even more participants next year! It’s such a joyful time of year and a time to be thankful for all of our blessings. Moxie wishes you a very Merry Christmas and a blessed New Year! Home About Us Services Portfolio Awards Blog Contact Us © Moxie Creative Studio. All Rights Reserved.